Hey, Mom! Are things too quiet at the dinner table? Want to liven up those listless children of yours? Well, your prayers have been answered with Zing Catapult Spoons! 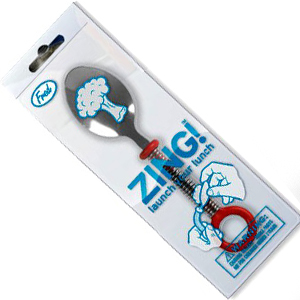 Thanks to Zings, your kids can now fling niblets, chicken nuggets, and mash potatoes across the dinner table! Oh, sure. It's always been possible. But it's never been so easy and so much fun! The secret of Zings is the spring built into the handle of the stainless steel spoon. Just grasp the plastic handle, load the spoon with some tasty morsel, pull back, and launch your lunch across the room. Is that fun, or WHAT?! 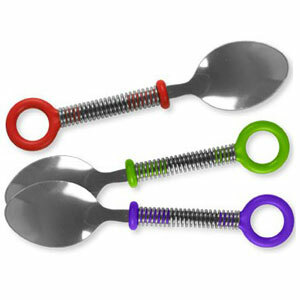 Yes, Zing Catapult Spoons are remarkably silly and very playful -- just like your kids. In fact, just like YOU!